Portion of 'The Formal Garden' wallpaper, depicting a formal tree in a planter on a garden plinth, scrolling foliage and horizontal bands of poppies and white lilies, on a green ground; Colour woodblock print on paper. Height: 83.8 cm Average size of E.1840-1934 and E.5100-5105-1919., Width: 57.2 cm Average size of E.1840-1934 and E.5100-5105-1919. 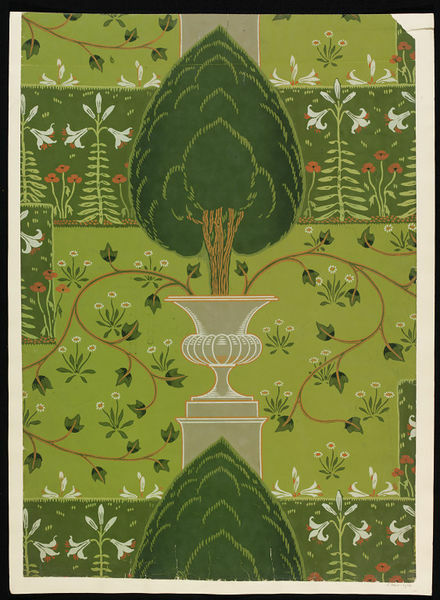 Portion of 'The Formal Garden' wallpaper, depicting a formal tree in a planter on a garden plinth, scrolling foliage and horizontal bands of poppies and white lilies, on a green ground; Designed by Walter Crane; Colour woodblock print on paper; Produced by Jeffrey & Co.; England; 1904. 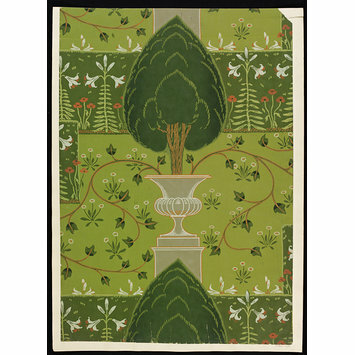 Spencer, I., Walter Crane, 1975.